A significant volume of representative herd data for northern Australia has been recently produced in a large modelling exercise, conducted under the auspices of the Beef CRC and assisted by experienced extension officers familiar with production systems for each region in Queensland, Northern Territory and Western Australia. The Beef CRC templates are stable state representations of breeding beef herds, generated in the Bcowplus software program. These are based on ABARE survey regions of northern Australia (Source: ABARE). Templates cover all of Queensland and Northern Territory, and Western Austalia Region 511 and that part of Region 512 north of 26° latitude (level with the Northern Territory/South Australia border). Whilst data is provided for production systems broadly representative of the regions, this data should not be used to represent possibilities for particular properties. The purpose of the templates is to provide a base scenario that can be modified to reflect the impact of Beef CRC research findings, for the purpose of valuing those findings. Some regions are represented by a single template, whilst others are represented by up to five templates. This is the choice of the officers providing the data. Multiple templates are used to represent different production systems of different types of country. There has been no conscious attempt to represent local government areas or statistical regions. The number of breeders for each region is determined from ABARE estimates based on ABARE survey properties. 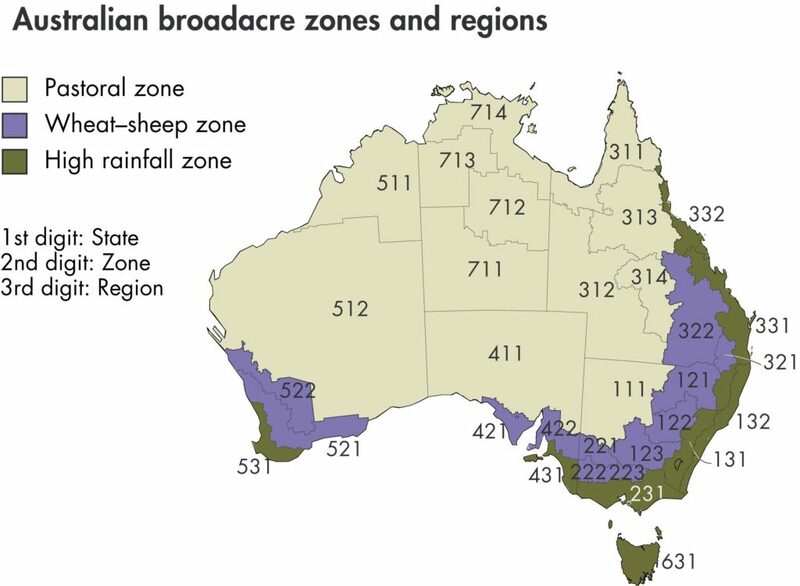 For regions represented by more than one template, breeder numbers are allocated to templates using ABS shire-based statistics or estimates from local extension officers. It could be argued that a suitable representation of the breeding herd would have the male cattle sold or transferred out as weaners. Our investigations however indicate that the market price for weaners seriously undervalues these weaners relative to their opportunity cost to the people who bred them. The profit centre of most breeding herds it seems, even in poor country, is the value that can be added to steers by keeping them for varying periods past weaning. Thus, evaluations are best done using herds set for whatever age of male turnoff was provided for the templates. Prices used in the templates were chosen by the officers providing the information. These prices are based on prices being received at the time, but judged across the season rather than on a particular day. Prices also reflect regional differences. Files are dated to indicate the general price environment when the files were created. The files themselves can be viewed using components of Breedcow and Dynama software now free off the web (Breedcow and Dynama), or the text and Excel summary documents can be viewed after downloading the whole content. To use these files, take one or more existing files, and alter the data to reflect the expected impact of implementing change enabled by the research finding. Each Bcowplus file purports to represent the breeding herd in a region or part of a Region. Each Bcowplus file is supported by an AECalc file and a Prices file. A research finding is valued by comparing the base (unchanged) Bcowplus file with a ‘change’ file that incorporates the effect of the research finding. If the effect is only a change in weaning rate or survival, with no accompanying impact of growth or prices, then simply doing another Bcowplus file will be all that is required. It is much more likely however that changes to the weights of breeders or progeny will result, for instance if improved fertility also tightens the calving so that the weaners are on average heavier at the end of the wet season. The effect will flow through to subsequent age groups. In most instances the evaluation of a new finding will require a recalculation of the AECalc and Prices files, transfer of AE ratings and net prices into the Bcowplus file and modifications to that file to incorporate changes to weaning % or mortality %, changes to female sales to dispose of surpluses, and the inclusion of any new variable costs incurred by the technology. The ‘new’ Bcowplus-defined herd is then set to the same total herd size (AE) as the original, to ensure comparison at the same stocking rate, and the gross margins compared. Difference in gross margins for these stable state comparisons is the eventual annual benefit of the technology once it has worked right through the herd. If the GM with the change is no better (or is worse) than the GM without the change, then the change is rejected. If the GM is better, then it must still be sufficient to justify the time lapse between investment and the incurrence of full benefit. If this is an obvious issue, it can be tested using discounted cash flow analysis, though this is beyond the scope of the Beef CRC templates. For this illustration, the data is split into that part of the profit (gross margin) generated by the breeders, and the part generated by growing out the steers. Growout was to ages ranging from a year and a half (live export) to four and a half years. Weaner steers were ‘sold’ from the breeding enterprise at market value to the steer enterprise at ages of five to nine months. Prices were estimated in April and May 2011, before the live export ban. This data aims to represent the whole herd in the defined area. Note that although the steer GM is the profit centre of the herd, the steers comprise the smallest part of the herd. The most profitable part of the steer enterprise, measured as GM/AE, is the first year after weaning, assisted by the lower AE ratings (weaners eat less than adults). Results indicate the highest GM/AE coming from steers, with the smallest proportion of the herd comprising steers, because turnoff is predominantly at a year and a half. The percent of total GM from the steer part of the herd indicates the disproportionate contribution of the steers.